Riesling, with its colourful German heritage, has emerged today as one of the world’s most collected wines. Ranging from sweet to bone dry and with everything in between, what is it about this incredible grape that has captured the hearts of serious wine enthusiasts everywhere? Join us to discover the beauty of this ancient noble variety! $50 per person - for tickets click here. In the past decade Spain has become a culinary star of Europe; a destination of choice for an ever growing army of chefs, restaurateurs and foodies alike! Whilst the greatness of Spanish regional food and wine is celebrated by many, finding the right Spanish wine and cheese pairing is not as simple as it may seem! Join us next Wednesday and put your taste buds to the test as we try to find the perfect pairing! Pigface is a salty-sweet fruit with an awkward name, but it's all kinds of delicious. That somewhat unfortunate name is apparently a reference to its looks: the pigface plant's flowers are said to resemble a pig's face - perhaps you might need to use your imagination here. It is also known as karkalla, ice plant or even the beach banana. The fleshy, juicy leaves have a slightly salty taste and because of this it makes for a great salt substitute - it works wonders in salads, and as a great accompaniment to meat, seafood or even egg dishes - perhaps your next breakfast addition? Now available from our produce department! Gruyére des Grottes is aged in natural limestone caves in the Swiss Alps. Ours has been aged for 24 months which bestows it with a rich and powerful character. The rind is dark, hiding a smooth and buttery paste, dotted with the pleasant crunch of those much sought after salt crystals. The flavours are sweet and earthy with strong notes of mushroomy umami. Enjoy in a gratin, decadent toasted sandwich, on a cheese board or simply in a crusty baguette. This is a very special cheese, not to be missed and only available while stocks last. Luke Lambert is one of the Yarra Valley's great winemaking talents. His single-vineyard Syrah and Chardonnay are not only a reflection of magnificent site selection but also a testament to Luke's gentle winemaking skills. Soft, ethereal and wildly expressive. These are stunning wines that deftly represent site, season, and varietal, and are obscenely well-priced for this calibre of wine. Take our advice, get two bottles of these phenomenal wines: one for now, then one for a couple of weeks down the line when you’re reminiscing about just how good the first bottle was and wishing you had another. In 1985 Austria was involved in a massive wine scandal. Fortunately, this led to a complete re-structuring of quality control in Austrian wine and the country has emerged as one of the top countries in the world in terms of production standards. It has become an exciting and modern wine country that also pays great respect to its ancient winemaking traditions. Austria is now producing wines of great elegance and structure. Often delicately perfumed with mouth-watering acidity, most of the wines are being produced on a small scale on family owned and run farms. Despite being a small wine producing nation, Austria offers a wide range of interesting wines that all share an amazing tension between ripeness and freshness. Austrian wines also offer incredible value for money. Mother Meg’s are dedicated to the art of traditional baking, using old family recipes to produce a delicious range of biscuits, fruit cakes and plum puddings. Selecting only the best ingredients ~ together with domestic recipes, no added preservatives and stylish packaging, they strive to be regarded as the premium brand in their class. Committed to uncompromised quality, taste and value and with 25 years’ experience, the bakers at Mother Meg's create a taste sensation that memories are made of. We have a range of Mother Meg's products in our grocery department! New stock just arrived in Wine Loft! Our most popular gin has just arrived back in store! Available from our Wine Loft - we are the only stockist in Australia! Iron Balls Gin is meticulously crafted at A.R. Sutton & Co. Engineers micro-distillery in the heart of Bangkok by master distiller and Fremantle local Ash Sutton. This gin is handmade from fermentation to distillation using freshly cracked coconuts and pineapple with hints of juniper, hillside ginger and lemongrass. Due to the small size of the distillery, production is extremely limited. Free range, happy healthy hens! Sat 10 March 2019 - in store! Little Farm Provedore & Pastured Eggs are one of the few genuinely Pastured Egg producers in Western Australia. Located in Brookton, their hens live in mobile caravans, no fixed sheds, that are moved to fresh pasture each week. The hens are free to roam and forage all day, engaging in natural chicken behaviour, protected by guardian alpacas, Tony, Chico, Kerry & Sir Frank. Their foraged diet is supplemented with the highest quality layer pellet available. Join us this weekend for a taste of these delicious free range eggs! Now avaliable in-store. Highly aromatic R2E2 mangoes are bigger in size than your average mango! They have a deep orange skin tinged with red and a sweet, mild flavour. A small seed means there is more delicious, fibreless flesh to enjoy. They are juicy, yet hold their shape when cut and eaten fresh. Our large R2E2 mangoes are grown locally in Carnarvon and have an exceptional shelf life. Simply eat as they are or incorporate them into smoothies, home-made popsicles and sweet desserts. Now available in our produce department! Join us next Wednesday for a fun and educational Masterclass on the Wines of Austria and Germany. Hosted by Sommelier Shaun Maher, this class will feature 10 wines, twin poured for comparison and discussion. German winemakers have long been known for producing some of the worlds most distinctive and aromatically pure white wines however their red’s, in particular the Pinot’s, are also being recognised for their quality and finesse. Jump across the border to Austria, one of the world’s oldest wine producing regions, and a new generation of winemakers are producing some of the best value artisanal products on the market. Learn all about these beautiful regions (and read their labels correctly!) and introduce yourself to the new and exciting wines entering the Australian market. Heirloom tomatoes are old open-pollinated tomato varieties that were grown before world war II. Or as Merriam-Webster’s Dictionary states “a horticultural variety that has survived for several generations usually due to the efforts of private individuals”. In general heirlooms are touted for their superior and complex flavors and equally for their fragility and perishability. For this reason they are best eaten straight! Amongst our wide range, we have 'Beefsteak' and 'Oxheart'. 'Beefsteak': Large, meaty, juicy red tomatoes, often taking interesting shapes with excellent flavour. 'Oxheart': Heart-shaped fleshy tomatoes with excellent flavour. Assists with staying in ketosis! Designed as a daily supplement to give you more energy, sharper concentration and a better mood, Luke Hines by Cocolife MCT Keto Tonic can be taken by the spoonful or mixed with food and drink to fortify your body and mind. This MCT Keto Tonic is 100% pure medium chain triglycerides, with a minimum of 53% C8 (the best one! ), and 36-47% C10. Now available from our health food fridge! Trays of golden Kensington Pride mangoes arrived from Gingin! These ready-to-eat Kensington Pride Mangoes have a firm texture and are not stringy. Also known as the KP or Bowen mango, these are Australia's most popular mango! They are bursting with sweetness and very juicy! Try Grilled Mango with Frozen Vanilla Yoghurt recipe by Donna Hay for a delicious, simple dessert. The world's first safe to drink raw milk! Made By Cow started with a simple question: Why are we still making milk the same way we did decades ago - heating and depleting it, pulling it apart, then recombining it? The owners of Made by Cow genuinely believed there was a better way, a way to make real, raw milk safe to drink...and they found it, using cold high pressure and nothing else but passion. Their patented method destroys the same harmful bacteria as heat pasteurisation, while being much gentler on milk's natural nutrients - minimal intervention for maximum goodness. Their free-range, Jersey herd graze on natural pasture year-round. They're lovingly cared for by third generation dairy farmers, Stewart and Hayley, who know every cow by name and keep the farm free from pesticides, petrochemicals and hormones. Happy and healthy cows create beautiful milk! This triple cream, French style Brie is made exclusively for Boatshed Market in Margaret River. Using fresh milk that is locally sourced from the South West, our Brie is ripened for longer leaving the core supple, creamy in texture with a delicate earthy flavour. 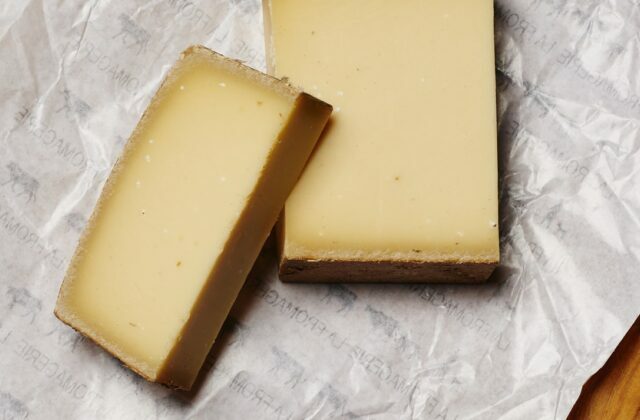 It is everything a Brie-style cheese should be and the perfect addition to your grazing board! Full wheels are also available from our cheese department.